David Cannon Chapman was born May 13, 1953 in Chattanooga, Tennessee and grew up in New Hartford, New York, graduating from New Hartford High School in 1970. He majored in agricultural engineering at Cornell University, receiving a B.S. degree in 1974 and a M.S. degree in 1976. He moved west for graduate school and received a Ph.D. degree in physical oceanography from the Scripps Institution of Oceanography at the University of California, San Diego in 1981. 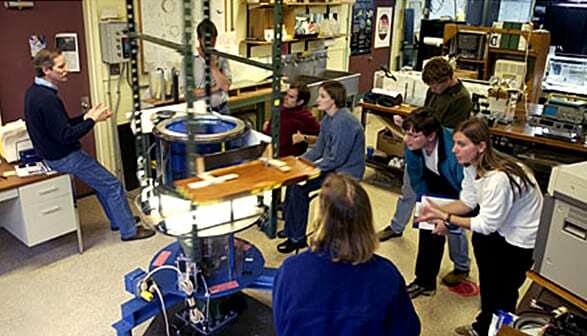 Dave then joined the WHOI staff as a postdoctoral scholar. He was appointed a postdoctoral investigator in 1982, and in 1983 was appointed an assistant scientist. He was promoted to associate scientist in 1987 and to senior scientist in 1997. Dave Chapman was a world leader in coastal oceanography and made many contributions to the understanding of a physical processes in oceanography. His work was of fundamental importance in understanding how coastal currents are driven by winds and river discharge. His initial work at WHOI focused on continental shelf waves, a class of subtidal waves that can be generated by remote winds and propagate many hundreds of kilometers along the continental shelf and slope, creating strong along-shelf currents. He advanced the theory of these waves and by careful comparison with ocean measurements obtained off California demonstrated both the power and limitations of his theoretical approach as a hindcast tool and diagnostic of forcing in the coastal ocean. His theoretical approach has been used widely to study these waves on other shelves around the world. During this period, Dave Chapman also became interested in the "shelf-slope" front found along the east coast of North America that separates relatively fresh shelf water from the saltier ocean water over the slope. Unsatisfied with existing ideas, he began a sequence of theoretical and numerical model studies that provided the first dynamically-sound understanding of the shelf-slope front, how it is formed, what controls its position and strength of the along-front flow, and how the front is maintained over thousands of kilometers against dissipation. The impact of this body of work on coastal oceanography has been profound. Dave Chapman's interest in the shelf-slope front led him to consider the behavior of freshwater plumes created by river discharge into the coastal ocean. In another set of numerical model studies, he discovered that there is a class of buoyant plumes in which much of the plume is in contact with the bottom, and consequently the dynamics are quite different from surface-trapped plumes. With many such plumes occurring in nature, his work provided a key new perspective on the behavior of buoyant plumes in the ocean. In the last decade, Dave Chapman became a leader in modeling processes over Arctic continental shelves. His work focused on understanding the influence of bottom topography and eddy processes on the formation and spread of water made dense by surface cooling in large coastal polynyas. While a significant advance in dynamical understanding, this work has also created entirely new directions for research, both theoretical and observational. His enthusiasm for his research was boundless. Despite suffering greatly from motion sickness, he once deployed instruments from an outrigger canoe in the Philippines to understand ocean waves. Throughout his career, he excelled at identifying fundamental scientific questions about the real ocean and then using a mix of theoretical and numerical model studies to gain deeper insight into the underlying physics of the ocean processes. Although primarily a modeler, he understood the importance of ocean observations and used them carefully to formulate ideas and test models. Dave will be remembered by colleagues and students as a gifted and persistent scientist focused on fundamental understanding, eager to share ideas and results and help others with their own studies. Dave Chapman was very active in the Institution's Education Program, serving as education coordinator for the Physical Oceanography Department in the early 1990s. He taught both basic and advanced courses in the MIT/WHOI Joint Graduate Program and was widely acknowledged as an excellent and creative teacher who cared deeply about his students and colleagues. He served as thesis advisor for several graduate students, thesis committee member for a number of other students, and advisor for several postdoctoral scholars.